The milky layer on your aquarium walls may be soap scum left from a previous cleaning and inadequate rinsing, or it may be mineral deposits left from evaporated water. Regardless of what type of scum it is, the same natural substance -- possibly in your kitchen pantry -- will remove either one and leave your aquarium sparkling. Don't use glass cleaner or bleach. Pour 1/2 cup of white vinegar into a large mixing bowl. Add 1/2 gallon of distilled water. Pour the mixture into a spray bottle for easier use if you desire. Take a clean rag and dip it into the vinegar-and-water mixture. Wipe the rag over the soap or mineral scum to remove. For stubborn areas, use a new toothbrush to gently scrub and loosen the scum. Rinse the aquarium thoroughly with fresh water and set the tank out to air dry.  If a layer of scum covers the majority of the aquarium, mix up a larger batch of the vinegar and water mixture. Fill the entire aquarium with the mixture and let it sit overnight. In the morning, take a clean cloth and wipe away the scum. 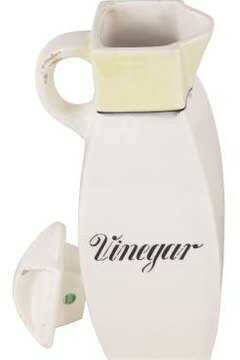 Drain the vinegar and water, and rinse with clean water. Allow the aquarium to air dry. ⚠ Do not use commercial window cleaner or bleach to remove aquarium deposits. These harsh chemicals can be harmful to your fish. ⚠ While vinegar is acidic, and large amounts can affect the pH in your tank. A few drops from a wet cloth while cleaning should not be toxic. Natural buffers in your water should neutralize the acid. thehousingforum.com: How to Clean a Fish Tank?